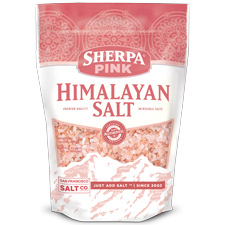 Sherpa Pink® Coarse Grain Himalayan Salt is an ideal salt for adding to a grinder or salt mill. If you want a salt for your grinder, this salt is for you. After grinding the salt is perfect for cooking, baking, and garnishing! Himalayan salt is a naturally harvested salt that is full or rich nutrients and minerals. Our coarse grain size shows off the natural beauty of Himalayan Salt crystals, making it the perfect choice for displaying in the kitchen. Note: This grain size was previously called Medium Grain.